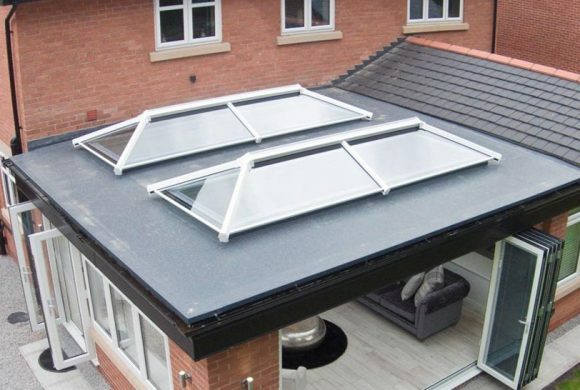 Roof lanterns are typically found upon orangeries or flat roof structures, providing homes with a stylish focal point whilst significantly brightening up interiors. Available in either uPVC or aluminium, there is some debate over which material is best. So in order to settle the debate once and for all, we’ve taken a closer look at both materials. Roof lanterns that are built from aluminium can be fitted with slender rafters and small ridges. This is because of aluminium’s inherent strength. Not only does this create a sleek, contemporary appearance, but it also means they can be fitted with slightly more glass than their uPVC counterparts. More glass = more light so they’re perfect for illuminating areas of the home. Aluminium roof lanterns are equipped with polyamide thermal breaks. The purpose of which is to significantly reduce heat transfer. As heat is prevented from escaping, more of it is kept inside the property. This leads to more comfortable homes and reduced energy bills. The anti-corrosive qualities of aluminium mean that it will not rust or corrode, even after years of weather exposure. Aluminium skylights are finished in a highly durable powder coating, which can last for decades without diminishing in quality. Any RAL colour can be applied to aluminium, so homeowners have a huge amount of choice for the finish. uPVC is an incredibly durable material that is resistant to rot, warping and discolouration. Therefore, any uPVC roof lanterns can easily retain a stylish appearance and keep out the weather for years to come. As uPVC is cheaper to manufacture than aluminium, uPVC lantern roofs, generally, cost less than aluminium ones. Lantern roofs built from uPVC tend to feature solid aluminium central rafters that are equipped with uPVC top and bottom cappings. This ensures for a rigid structure and because uPVC is a naturally insulating material, homes are insulated very well too. uPVC skylights come in a selection of colours. Woodgrain textured finishes can also be applied to them, for a look more resembling of natural timber. Either lantern roof option is tested to withstand extreme wind and snow, and their size comes tailor-made to the requirements of individual properties. A manual or automatic roof vent can also be added to the skylight, so you can regulate temperature and reduce the build-up of condensation. Whether you’re looking for an aluminium roof lantern or one built from uPVC, Associated Windows can help. We install roof lanterns built from either material to homeowners throughout Bristol and the surrounding areas. If you’d like one for your home, please call us on 0117 9311777 or contact us online.